I have to clear coat it in a few days. Thanks, I have the Batavus boxed up to go out Monday. You get all your shipping stuff back. I have a question! 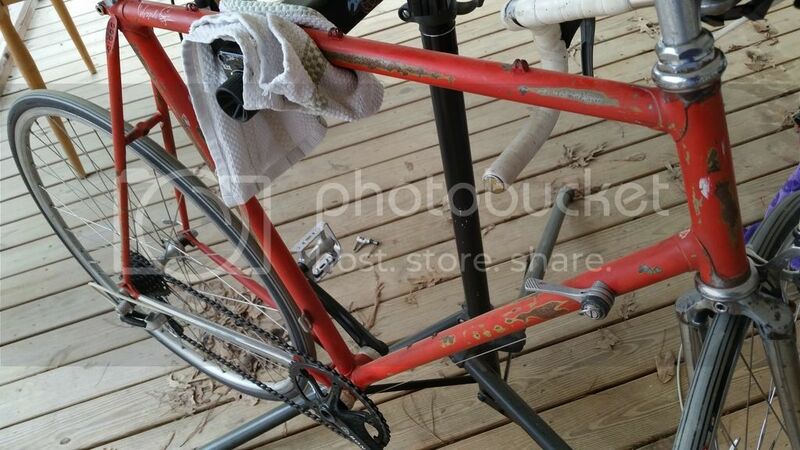 I will be painting y Miyata 610 this Fall with base and clear. How long after spraying the base coat do you have before applying the clear coat? What paint did you use? Check with your paint supplier. Paints have different set up times. I use lacquer, it sets up a lot faster than enamel and I don't have wait near as long as other paint. @daf1009 - I wish that I could make a living at it Plans to open a shop after retirement. @tandem - Tom I used Rust-oleum adhesion promoter, metal coat, and gloss clear coat. 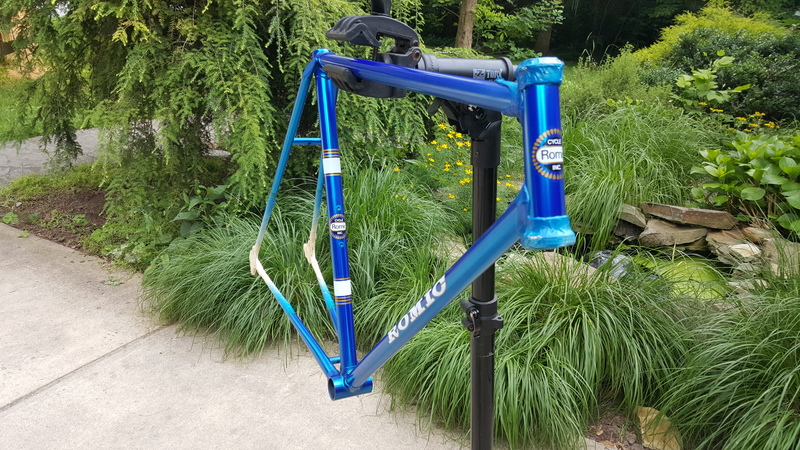 I did a test before spraying a whole bike and it seems pretty durable as long as you use the clear. @sloar is right, if you are using other than rattle cans, your supplier will have the best process to use. Painting is not one of my talents, very nice work. Congradulations. Wow! Nice work. Any tips? That's beautiful. I suspect you have far more patience than I do. Have your wife do the masking! I have no patience for that. 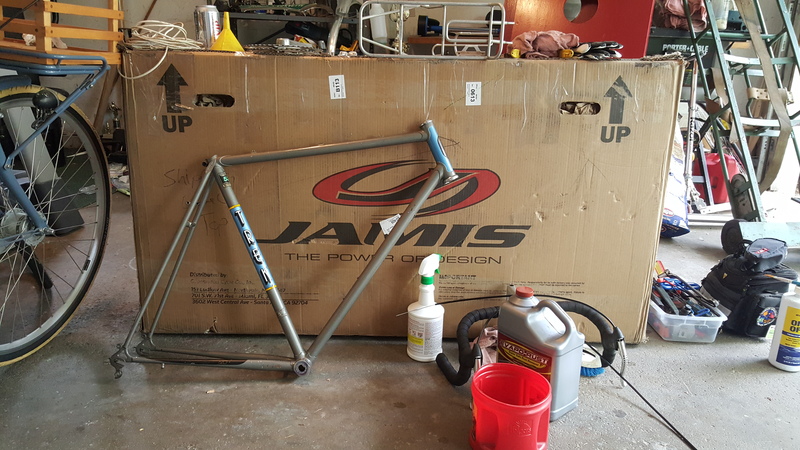 preparation is key, I spend weeks working on a frame and paint in one day. Also weather, humidity will play hell with your paint. Morning time is best. I wait until humidity is below 45%. Last edited by horatio; 07-04-15 at 01:39 PM. Very nice job!! I love the color. It's a Ciocc. No idea about the fork, though. 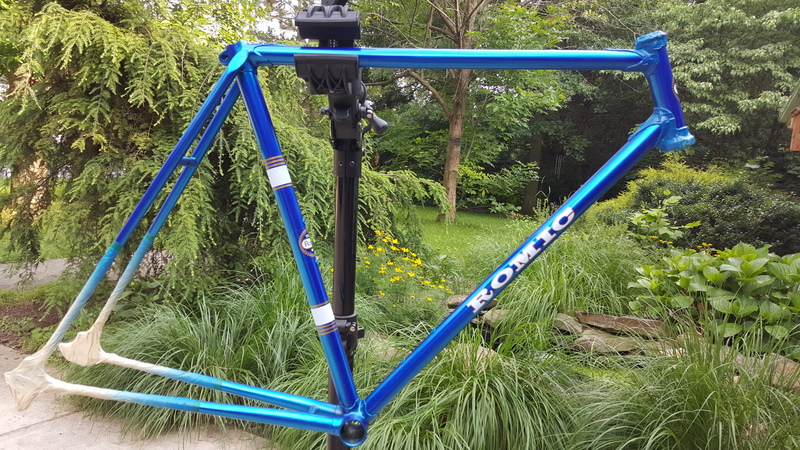 I'm thinking of a respray in white, and adding a carbon fork. 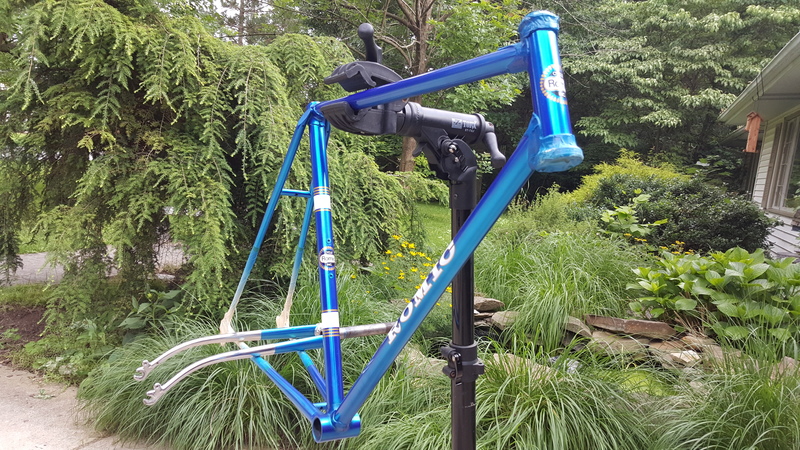 Can't seem to find any reasonably priced Ciocc forks. I had planned to send it to @sloar for repainting, but my funds have run dry. Last edited by horatio; 07-04-15 at 03:06 PM. Give it a go, you can't make it look any worse than it does now. Shawn, you slay me, man! So what method did you use? Are you saying this is a rattlecan? Also, it looks like you chose vinyl adhesive style decals. why that as opposed to the water slide? I got decals from velocal. Wow, that's insane. I didnt realize you could get those results with a rattlecan. Last question, what brand paint did you use. I'm assuming a polyurethane enamel of some sort? Good job. She looks beautiful. Really does look great. I'm tempted to do it one of my bikes. Ive painted pretty extensively with rattle cans and you sure cant beat the price.